The operating requirements of a rotary platform can vary widely depending on farming style. 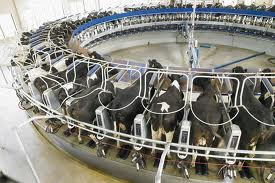 Variables such as cow size, cow weight, milkings per day or year and platform deck material should be carefully considered when choosing your rotary milking solution. The DeLaval parallel rotary PR1100 & PR2100 range of rotary milking solutions has been engineered to cater for these large variations in duty requirements. Your new DeLaval parallel rotary PR1100 & PR2100 rotary milking solution will be configured to suit your individual farming requirements.